Lock in a great price for Courtyard Rochester East / Penfield – rated 9.1 by recent guests! Friendly reception staff as well as support staff. Looking forward to breakfast. Ron was an amazing front desk person. So incredibly nice and accommodating. He made the stay way better than anticipated and will be the reason for my return! We needed an overnight stay to celebrate a graduation. We enjoyed a lovely room with fabulous service from every staff member we encountered. They couldn't do enough to make our stay just perfect! This property off the road, a very welcome mountain setting. We enjoyed to sound of birds and wind, not road noise. The staff very attentive and helpful! Staff was courteous with late checkout which was greatly needed and appreciated after a hard morning digging in rain. The Hotel was clean and quiet, in spite if it being backed up to the thruway. Great hotel, clean and well maintained. Amazing customer service and front desk staff. Bra frukost, trevlig personal och bra läge för mittt syfte. Courtyard Rochester East / Penfield This rating is a reflection of how the property compares to the industry standard when it comes to price, facilities and services available. It's based on a self-evaluation by the property. Use this rating to help choose your stay! The Courtyard Rochester East / Penfield is located 13.5 miles from Rochester Airport. It provides a complimentary airport shuttle service, and offers spacious rooms with free Wi-Fi and flat-screen TVs. Rooms at the Courtyard include luxury bedding, and a large well-lit work desk. Rooms come equipped with a small refrigerator, coffee maker, and ironing facilities. At the Bistro guests can enjoy Starbucks coffee and American cuisine. A local restaurant dinner delivery service is also available. 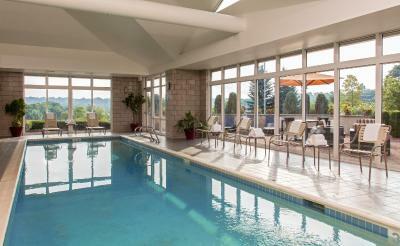 The Courtyard Rochester East features a heated indoor pool, and a whirlpool. The hotel also includes a fitness center with free weights and cardio equipment. The George Eastman House is situated 4.5 miles from the Courtyard Rochester East / Penfield. Free public parking is available on site. This property also has one of the top-rated locations in Rochester! Guests are happier about it compared to other properties in the area. This property is also rated for the best value in Rochester! Guests are getting more for their money when compared to other properties in this city. When would you like to stay at Courtyard Rochester East / Penfield? This room has a flat-screen cable TV and a refrigerator. 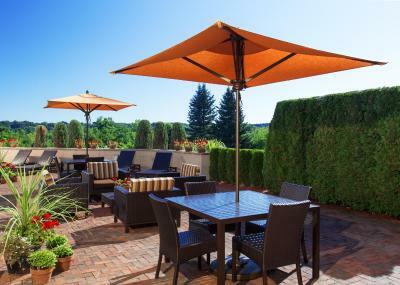 Refresh your travel routine with a stay at the Courtyard Rochester East/Penfield. Our Penfield hotel is equipped with free Wi-Fi, sports fresh on-site dining options at The Bistro and offers plenty of space to work and relax in style. House Rules Courtyard Rochester East / Penfield takes special requests – add in the next step! Other Courtyard Rochester East &#47; Penfield accepts these cards and reserves the right to temporarily hold an amount prior to arrival. Courtyard Rochester East / Penfield accepts these cards and reserves the right to temporarily hold an amount prior to arrival. Please note that the renovation for the property will be done in phases and will conclude in February, 2018. No bike in the gym, we are not treadmill folks. Pool more than compensated for this missing piece of exercise equipment. The hotel charged my credit card 2X's for incidentals $10 on the day of arrival and $25.22 on the day of departure. Pretty excessive considering I didn't have any "incidentals". And I was only staying one night! Wish breakfast opened earlier or at least a make a waffle option for those who have to leave early in morning. Room was great. Beautiful area.